A KNL based cluster (Knights Landing (KNL) ) has been installed in February 2017. The cluster consists of 4 KNL interconnected by OmniPath. 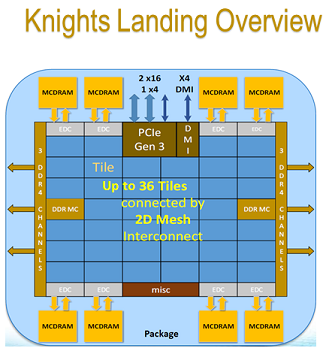 Knights Landing (7230) is a highly configurable architecture. Memory bandwidth is one of the common bottlenecks for performance in computational applications. KNL offers a solution to this problem. 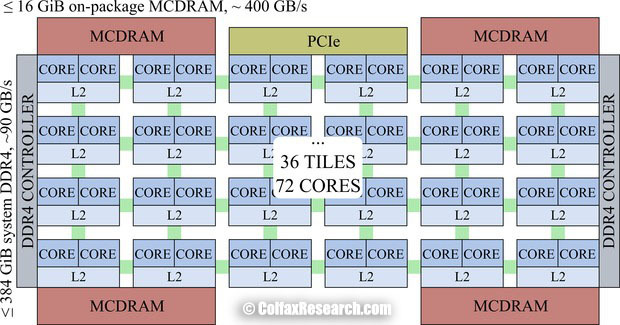 To do so, the 2nd generation of Intel Xeon Phi (KNL) has on-package high-bandwidth memory (HBM) based on the multi-channel dynamic random access memory (MCDRAM). This memory is capable of delivering up to 5x performance (≥400 GB/s) compared to DDR4 memory on the same platform (≥90 GB/s). More information is available in this Intel tutorial. 32 tiles of 2 cores each with a L1 cache, and 1 shared L2 cache. More information is available in the colfax documentation. To allow users to test the different configurations, the 4 nodes of the cluster have all been configured with different parameters. Information on the different configurations is available in the PlaFRIM hardware page.